Artistic Wire Large Crimp Connectors are the perfect cold connection to join large gauges of Artistic Wire together. Perfectly calibrated for 12, 14, and 16 gauge Artistic Wires, you can also use them for Artistic Wire Braid, 12 gauge Alumium Wires, and to join multiple strands of smaller gauge wires. To use, place one end of the wire that you are joining half way into the Crimp Connector. Place the other wire in the opposite end so that the wires meeet in the middle. 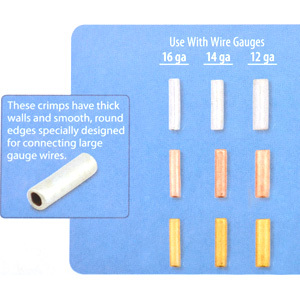 Use the back notch of the Mighty Crimping Pliers for the 12 and 14 gauge wires and the Standard Crimping Pliers for the 16 gauge wires to gently squeeze one side of the crimp then the other for a secure connection.